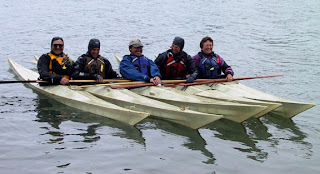 I did a Greenland kayak building class up in Arcata, CA. For those of you not into CA geography, Arcata is on the north end of Humboldt Bay which is not too far from the Oregon border and right in the heart of redwood country. 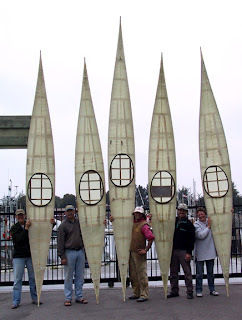 Here's the group with their finished boats. Michael Morris's boat was a little over 17 feet long. Everyone else built 15 footers. They do a lot of rock gardening up near Trinidad so they thought that shorter boats might be handy. Here's the group on the water in Humboldt bay. The bay is a little warmer than the open ocean, but these guys were more or less duded up for immersion, complete with drysuits and neoprene head gear. The water is cold up there.